Could we get TWO new Star Wars sagas? We already know that Star Wars: The Last Jedi has been charged with developing a new saga trilogy to follow on once the Skywalker saga is concluded with Episode IX. But now it appears there is another saga in the works, this one from the minds of Game Of Thrones creators David Benioff and D.B. Weiss. We wonder if this might squeeze out the anthology films, while these two sagas interleave their release years. Of course there were no details on release dates or plot, but Iger did say they were focused on “a particular point in time” in the Star Wars universe. I’m still hoping for some new stories set in the Old Republic. Actor Roy Dotrice passed away peacefully today at the age of 94 in his London home surrounded by his three daughters, grandchildren and great grandson, his family confirmed in a statement. Probably most know recently for playing Hallyne the Pyromancer in a couple episodes of Game of Thrones in 2012, his acting career spans many years on stage, small and large screen, and he won a Tony Award in 2000 for Best Featured Actor in a Play for his role in A Moon for the Misbegotten, and held the Guinness World Record in 2004 for most voiced characters in an audio book for his reading of A Song of Ice and Fire. He was also awarded the Officer of the Most Excellent Order of the British Empire (OBE) in 2008. Dotrice was no stranger to genre roles either. He was originally set to play Grand Maester Pycelle in Games of Thrones but withdrew for medical reasons (the role went to Julian Glover.) He made two memorable guest appearances in Space: 1999 as Commissioner Simmonds, which sticks in my head for the horrible death he (presumably) suffered. He also had a starring role in the Beauty and the Beast series in the 80s. He had other guest appearances in Babylon 5, Hercules: The Legendary Journeys (as Zeus, no less! ), Earth 2, and Sliders among many, many roles. He also had a starring role in one of my favorite Olympics-based movies as the Russian skating coach Anton Pamchenko in The Cutting Edge. Dotrice was married to his wife, actress Kay Dotrice, for just short of 60 years when she passed away in 2007. His three daughters were also actresses – Michele Dotrice (Some Mothers Do ‘Ave ‘Em), Karen Dotrice (best known as the young Jane Banks in Mary Poppins), and Yvette Dotrice (Crossroads). The primetime Emmy nominations are out…so how did our favorite genres fare? Naturally Game Of Thrones leads the pack by far, with 23 separate nominations (which led all shows), including three for Best Supporting Actress and two for Best Actor. It was good to see Tatiana Maslany still on the list for Orphan Black, hoping she finally gets what she deserves. Walking Dead was still noticeably absent, with two minor noms. Game Of Thrones was the big winner not just among the few genre programs nominated, but overall and even for all time, taking home 12 different Emmys – the most ever taken by a single series in a single year! And this was with writer George R.R. Martin in attendance. The series took home the Outstanding Drama award at the conclusion of the night, after it had already won Director (David Nutter), Supporting Actor (Peter Dinklage), and Writing (David Benioff and D.B. Weiss). The other eight were awarded last week at the Creative Emmys. Alas, no other genre shows won anything at the Big Show. The 2015 Emmy nominations list was released today, and Game Of Thrones is king of the hill at 24 nominations (out of HBO’s 126 total…the next closest network was FX Networks at 38.) American Horror Story: Freak Show followed in second at 19. Gotham and The Walking Dead weighed in at 4 a piece. Among the Marvel series, Marvel’s Daredevil managed 3 nominations, while Marvel’s Agents Of S.H.I.E.L.D. only managed one. 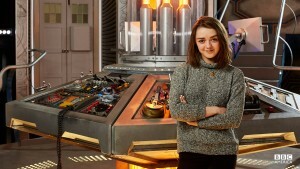 Maisie Williams, who plays the diminutive but fiery Arya Stark on Game of Thrones, will guest star on the upcoming season of Doctor Who. 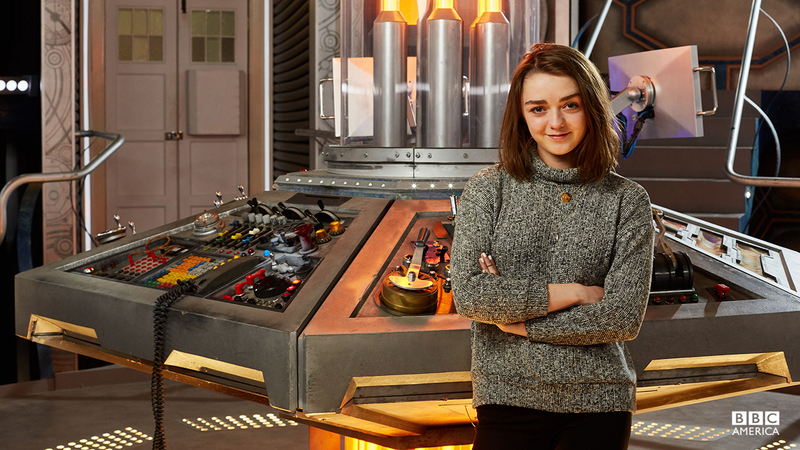 The award-winning actress went straight from a U.S. tour to the TARDIS to film her guest role.